it's a beautiful french vanilla cream color with pink roses. and I added a mossy ribbon layer to line the shelves. I have been feeling ready for a change in my hutch. 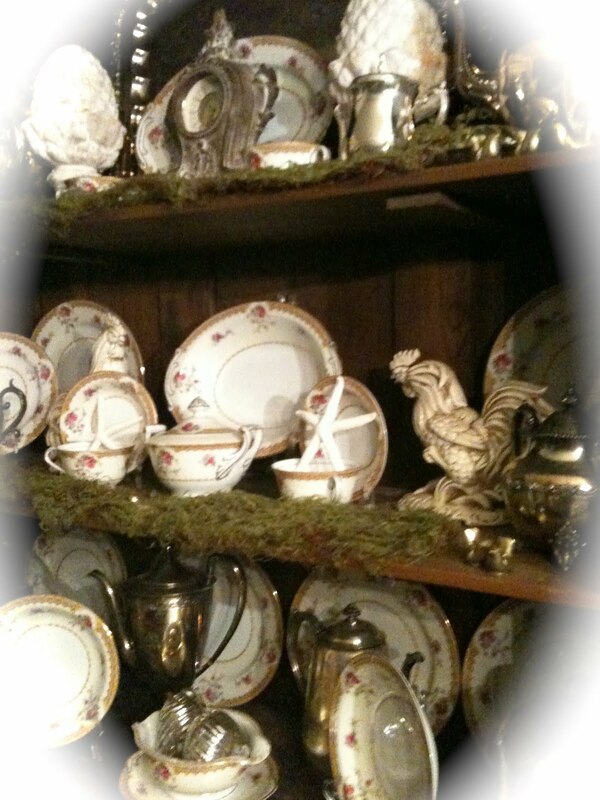 I usually have a set of antique green transferware displayed in here. some creamy whites & garden elements. and you know I am always changing things. For now, I am loving the romantic feel of this pattern. My buffet is filled with sweet, lovely, blooming flowers! It all looks so pretty, even the before picture. I think the moss adds just the right amount of texture and color. Beautiful! Looks so pretty Courtney! 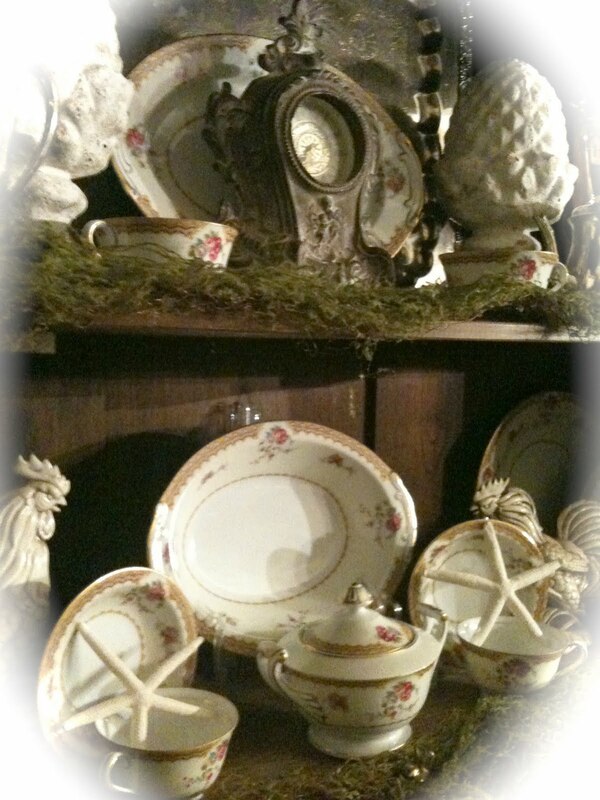 I love the romantic china and the moss with the old silver. Hey Courtney ~ I love the garden elements and the little 'spring' touches! I too, have been dreaming of the warmth of the springtime sun. Your china is gorgeous ... it's nice to have options and be able to change it up! I never would have thought to use moss. I love it! It's a perfect textural element. Lovely. I'm glad I'm not the only one thinking of spring. I absolutely can't wait to see flowers again in our garden. Now that Christmas is over, I've had enough of the winter weather! 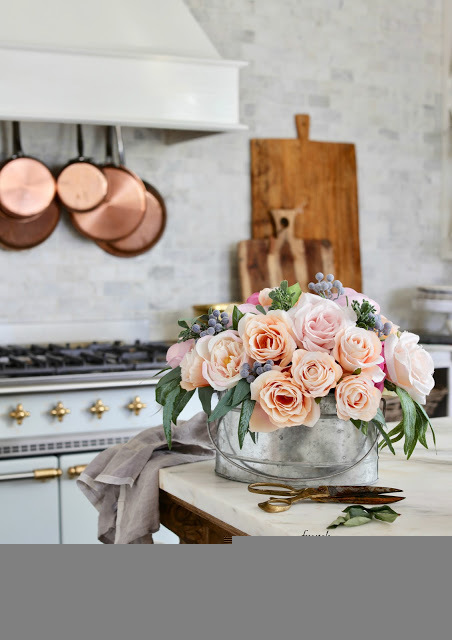 Courtney, I loved it before, but it is so creamy beautiful now...Love the moss and the roosters, and the silver and the mercury glass, and, well I just love it!! All of your china is beautiful but I don't blame you for thinking spring! Love the moss!!! Pretty...Pretty....Pretty....that is all I can say! Courtney, I love those dishes and the added moss is a great idea. So pretty. Thanks for joining the party again. 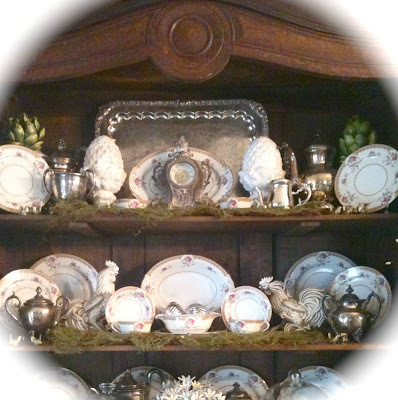 Your china is so pretty in your hutch with all the garden elements! It really is reminiscent of spring! I know I've told you before, but you really have a talent for layering. Great idea to add the moss! It was -5 degrees in CO, today. Your reminder of Spring and warmer days is beautiful! So pretty! You are making me dream of spring! 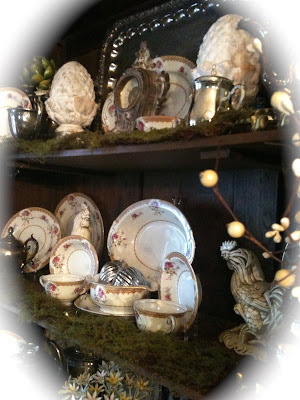 I love the moss on the hutch...it's really pretty. I think I just may have to do that. The china is gorgeous...now and before too. 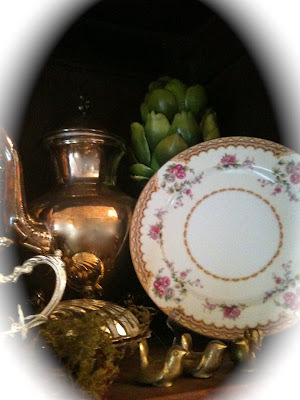 I remember that green transferware from one of your other posts. Gosh it all looks so pretty! 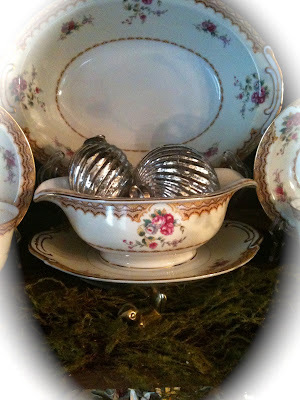 You do have a talent for displaying all of your pretty things. I love the mix of china and silver. Silver just makes everything look great, no? This vignette in this buffet is breath taking. 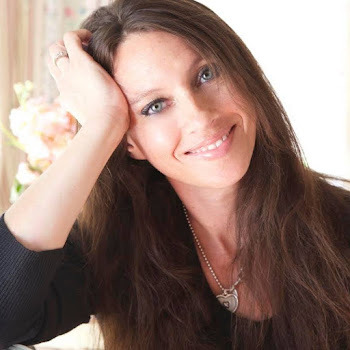 Wow, how gorgeous! 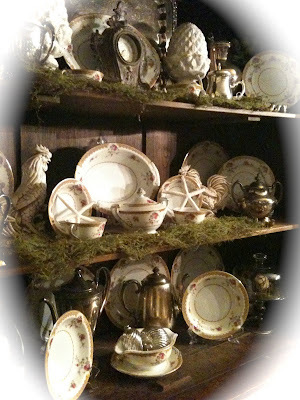 I loved the green transferware display, but totally love your new look, too. You are a true master at design. I could stare at this all day. Love the dishes and the touch of moss. It's all so pretty! The buffet looks gorgeous and reminds one that there is something to look forward to after all the snow disappears. 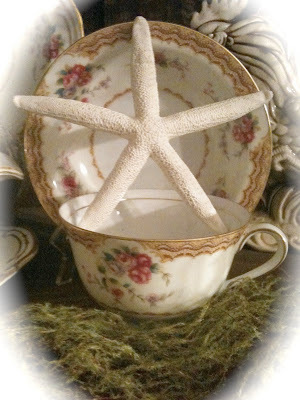 I agree, the moss is such a fun touch and of course the star fish just finish it off! Your hutch is stunning!! Love the old silver and the moss is brilliant! So feminine and gorgeous!!!! Such a romantic look. Love that pretty china. Your hutch looks like spring is blooming. Just what we need to see! 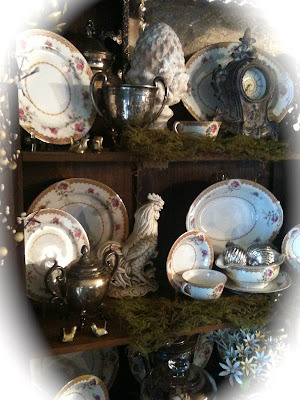 So much beautiful eye candy, love your china... it's gorgeous!!! Courtney, The china is very pretty and gives a romantic feel for sure. I would have never thought to accent with the moss but it really is a nice change. Makes you feel warmer days are close by! I love what you did! What is the greenery you used? it looks so much lighter and prettier! love it! Very nice! Hope you'll come see the picture wall I helped DD2 create for her home. I so love the after look. 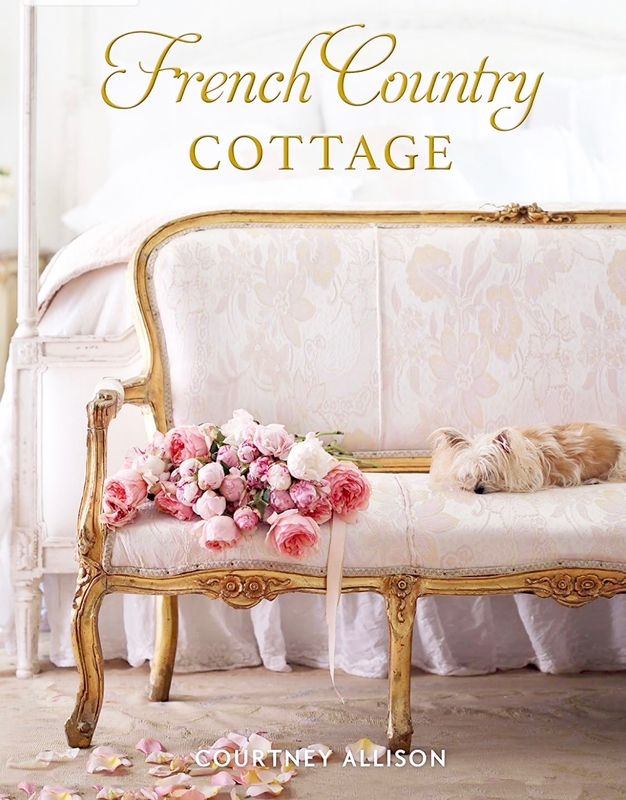 Your green was pretty, but the French cottage look is gorgeous!! I have my aunt's "Mildred" pattern china, and while the pattern is quite different from your sweet little pink roses, it is very similar too. I know, I know - - - that's an oxymoron, but TRUE! Oooh...sooo many pretties, sweet friend! I loved getting a peek at "the before" hutch! I really do have a thing for green transferware! You have some lovely pieces! But I also love your new look with the fabulous french vanilla china! What a beautiful and sweet pattern. You're right...the little rose pattern is charming! Wow...you really did create a beautiful vignette for your hutch, Courtney! I love how you used the moss on the shelves! Sooo pretty! 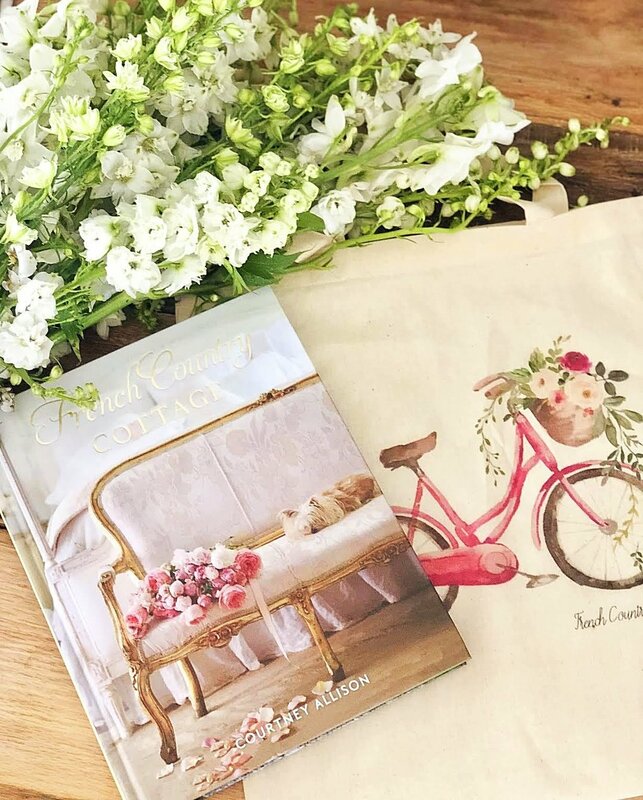 Thank you so much for sharing his sweet repost with us for the Sunday Favorites party, dear friend! As always...such a pleasure! Have a super sweet Sunday!